Who can you depend on? Who can you trust? Who will be a valued friend or a trusted associate? 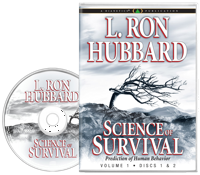 In the Special Course in Human Evaluation Lectures, L. Ron Hubbard shows you how to apply the technology of Science of Survival and the Hubbard Chart of Human Evaluation across your dynamics. You’ll learn how to expertly use the Tone Scale to gain agreement, cooperation and action. So don’t guess about people. Know them and know how to deal with them. In the last chapter of Dianetics: The Modern Science of Mental Health, L. Ron Hubbard spoke of the broad application of Dianetics to the Third Dynamic, with the ultimate aim of a world without war, where Mankind could aspire to higher goals. Thereafter, research into both the First and Third Dynamics progressed in tandem, with each study illuminating the other. The discovery that Life Energy existed as separate and distinct from the physical universe further illuminated the true nature of a group as a life entity in itself—quite distinct from MEST. Moreover, just as with an individual, a group was attempting to conquer the physical universe, and with each failure came consequent enturbulation and drop in tone. 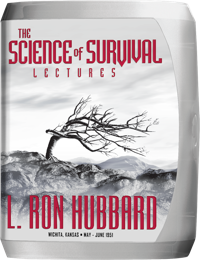 But given group survival is dependent on both group and individual tone level, L. Ron Hubbard provided something more. It followed from the fact that just as an auditor must be able to evaluate the case state of a preclear, a group must be able to evaluate the state of its members and so predict future behavior. Thus in early 1951, at his home in Palm Springs, California, Mr. Hubbard began mapping out the complete manifestations of human emotion, character and reaction at every level of survival. 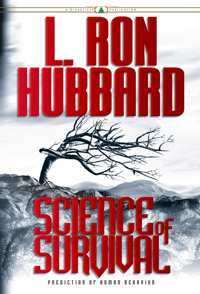 This work culminated in the landmark Hubbard Chart of Human Evaluation and its comprehensive text, Science of Survival. With this technology at hand, he next scheduled a Special Course in Human Evaluation, to be held at the newly formed Dianetics Foundation in Wichita. In addition to Foundation students, and in evidence of the sweeping demand for this technology, many Wichita civic leaders and industrialists were also present. Whereupon, commencing on 13 August 1951, Mr. Hubbard revealed all he had discovered encompassing human behavior on both the First and Third Dynamics: the nature of life force and its role in the physical universe, the interaction of the Eight Dynamics, the vital importance of group ARC and the application of the Tone Scale and the Hubbard Chart of Human Evaluation across every dynamic. 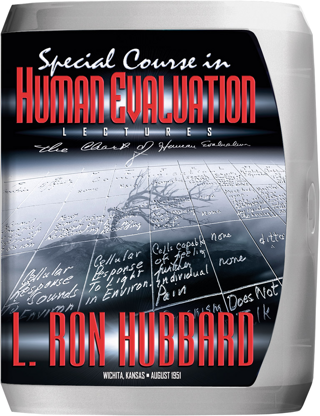 Containing L. Ron Hubbard’s watershed technology of Human Evaluation, what these lectures represent is a major step in the achievement of the Third Dynamic technology he first postulated in 1950.